Pablo Canavosio made his international debut for Italy against Australia during their summer tour in 2005. He cemented a starting place during the 2006 Six Nations and maintained his place through the 2006 autumn internationals. Having played in two of Italy's qualifying matches for the 2007 World Cup, his involvement at the tournament was limited to a single appearance against Portugal. He started Italy's 2008 Six Nations opener against Ireland on the wing, but was withdrawn after only 20 minutes due to a shoulder injury. In 2010 he was recalled to the Italian squad for the Six Nations and scored the winning try as they defeated Scotland at the Stadio Flaminio. 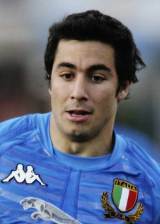 Canavosio has played his club rugby for Viadana, Rovigo, Calvisano and French side Castres - but signed for Aironi in time for their debut season in the Celtic League. Canavosio was used as an impact player during the 2011 Six Nations coming off the bench three times in the scrum-half berth and once in the centres. He will hope his versatility will pay dividends in the forthcoming World Cup having been named in Nick Mallett's 30-man squad.